Preheat oven to 400°F. Lightly brush Medium Rectangular Baker with canola oil using Chef's Silicone Basting Brush. Slice bread into 1-inch cubes; set aside. Pour evaporated milk into small microwave-safe bowl; microwave on HIGH 3 minutes or until hot. 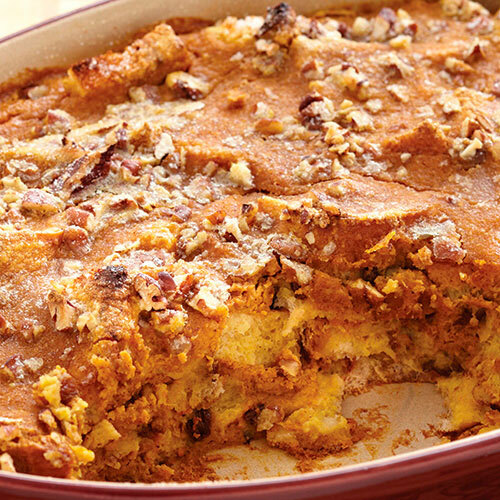 In large bowl, whisk pumpkin, 1/2 cup of the sugar, eggs, spice blend and orange zest until smooth. Gradually whisk hot milk into pumpkin mixture. Place half of the bread cubes over bottom of baker; pour half of the pumpkin mixture over bread. Top with remaining bread cubes and remaining pumpkin mixture. Sprinkle pecans evenly over bread. Sprinkle with remaining sugar. Bake 25-30 minutes or until set. Let stand 15 minutes before serving. Serve with frozen yogurt or whipped topping, if desired.